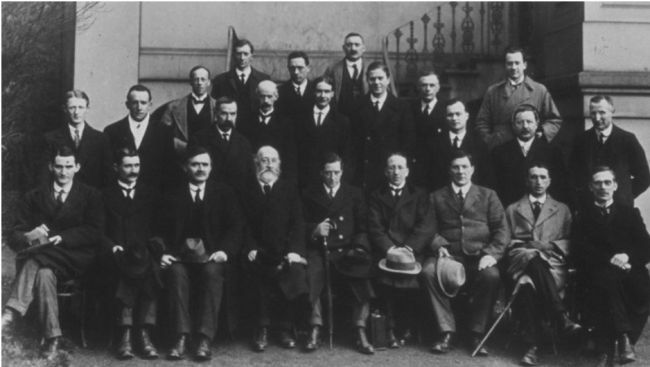 The first meeting of Dáil Éireann was held in the Round Room of the Mansion House, a few weeks after the tumultuous elections of 1918, which saw the victorious Sinn Féin candidates reject the Westminster parliament and declare independence. Some will say that Ireland failed these first leaders of the Irish Republic. That we became poorer and did not treat the people well. Perhaps some level of a check of what went on those years between. The so called uk was a bully evil state! They never stopped slavery btw, just reinvented it!, Go ask the poor and the poorest in their so called commonwealth like Kenya of the 1960's generations! Slaves to the agents of the mafia crown. For the next 60 years until Ireland joined the EU, sad reality was Ireland could barely make laws or get out of the debt and had to cope with the hangover of extremes of poverty and abuse a land and people wrecked and abused by the so called uk. However it is some truth to say, that we are run in the North by the German mafia family in London and by the German mafia EU in the south. But Ireland generally is a lot better off than the so called uk and certainly extremely better off out of it! Thanks to the IRISH women men and children of 100 years ago and those before them, who said no to the so called uk and their pathetic idolatry of the descendants of a german mafia family, so called royals. Thank You the Irish of old!